Not much of a confession, unless he has attempted to find the teat of a tree nut. 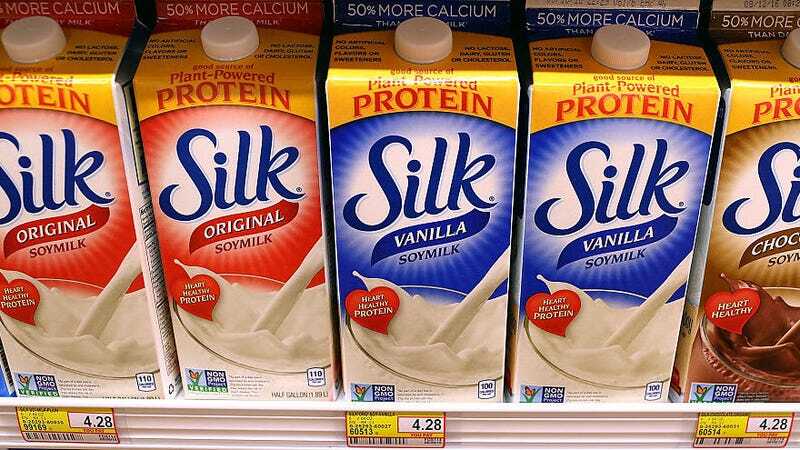 The takeaway here is that Gottlieb has pledged to bestow a gift upon Big Dairy in the form of new marketing guidance documents that may limit the ability of soy, almond, cashew, and other blended plant drinks to call themselves milks. As Politico reports, this sort of protectionist stance towards dairy was attempted before by Tammy Baldwin, a Democratic representative from Wisconsin, in early 2017 through the DAIRY PRIDE act, which yes, is an acronym: the Defending Against Imitations and Replacements of Yogurt, Milk, and Cheese To Promote Regular Intake of Dairy Everyday Act. Unlike Baldwin’s stalled pro-business gambit, Gottlieb doesn’t appear to be concerned about the borrowing of dairy terminology for solid foods, e.g. peanut butter, or vegan cheese. Weird oversight, Scott! Wow, those are so much better. Thanks Scott for giving us this linguistic space to play in. Art through adversity, baby!